New York police officers will be able to choose from a department-issued iPhone 7 or iPhone 7 Plus. It’s part of a $US160 million program that will give every police officer a smartphone. NYPD used to use Nokia phones running Windows Phone. New York police officers patrol the streets of the city armed with a badge and gun – and soon, an iPhone, too. The New York Police Department has started to give out new iPhone 7 or iPhone 7 Plus phones to officers for their job, according to the New York Daily News. The plan is that every New York Police Department officer in the city will eventually have an iPhone that will allow them to access criminal background checks, look up addresses, check for 911 calls as they happen, and fill out paperwork. NYPD is giving the new phones out in Manhattan at a rate of about 600 phones per day, and police in the Bronx and Staten Island already have them. Police are excited. “I truly feel like it’s the ultimate tool to have as a patrol cop,” an officer told the Daily News. The head of NYPD’s Strategic Technology Division called the Apple phones a “force multiplier,” partially because it can sent alerts to all cops with iPhones in a geographic area. NYPDThe phones previously used by NYPD before iPhones. New York police already receive a work phone – the big change is that it will now be a relatively new iPhone, instead of an ageing Nokia Windows Phone. The city announced a $US160 million “mobility initiative” in 2014 to give every cop a phone, and finally finished the Windows Phone rollout in October 2016. But shortly afterwards, the city decided that iPhones may be a better tool for police than the Nokia phones it had been previously using. An NYPD spokesperson said last year that the iPhones would be provided to the department at no cost, and the Daily News reported on Monday that the new phones are considered a hardware upgrade under the police’s contract with AT&T. 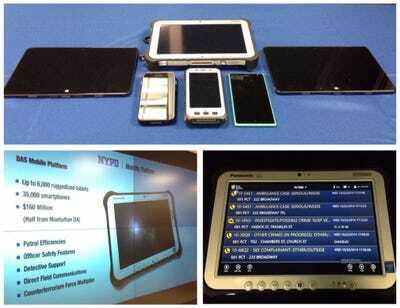 There is one good reason why NYPD would have to switch from Windows Phone. The Nokia phones police were using were released in 2014 and 2015, and last year, Microsoft officially discontinued support for Windows Phone 8.1 software, which the devices used. Without official Microsoft support, the NYPD could’ve been using insecure devices. Still, the Nokia phones were effective, leading to an 8% reduction in response times, a spokesperson said last year. Just imagine what they can do with a faster iPhone.